In the living room and throughout the house, paintings by Stein, an artist, enliven the walls. The living room is the apartment in microcosm: all contours and texture, mixed materials, muted jewel tones, water references, and modern moments—carefully composed in a painterly way. Bee drawings in the sunroom are mounted on wallpaper intended to represent the insects’ busyness. 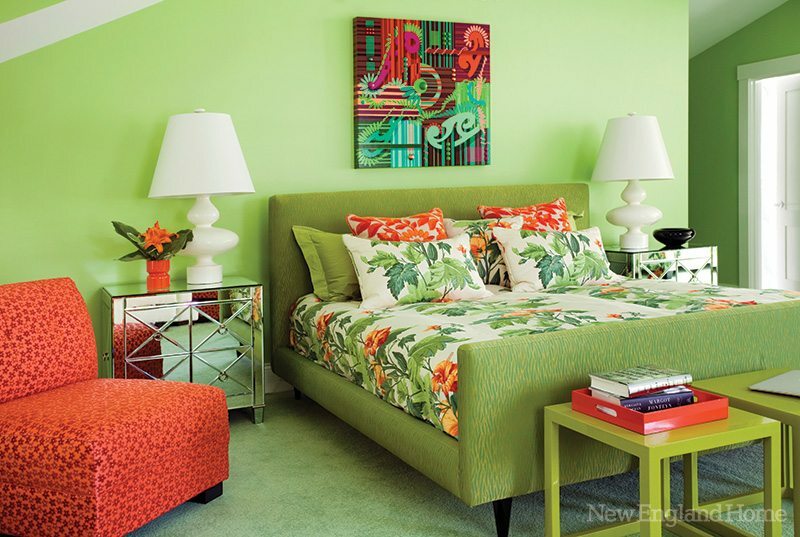 A bold green bed stands in contrast to a bedroom’s sedate white walls. 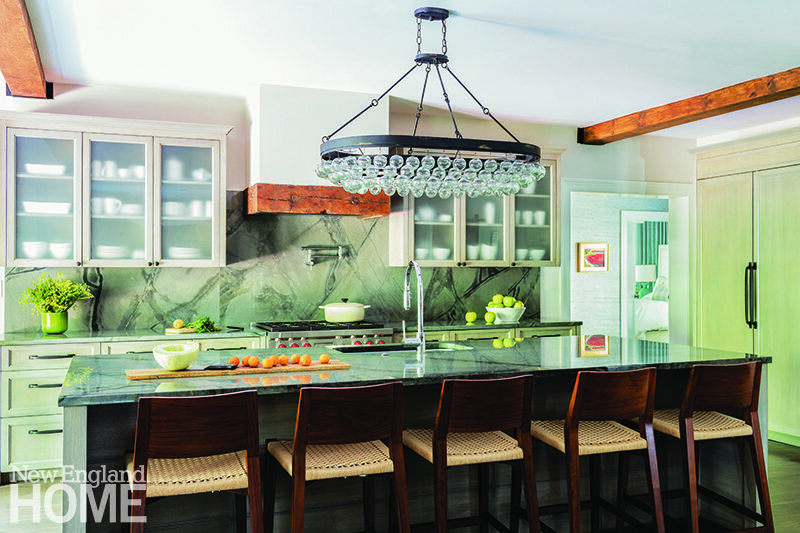 A game table and upholstered chairs claim a quiet corner. 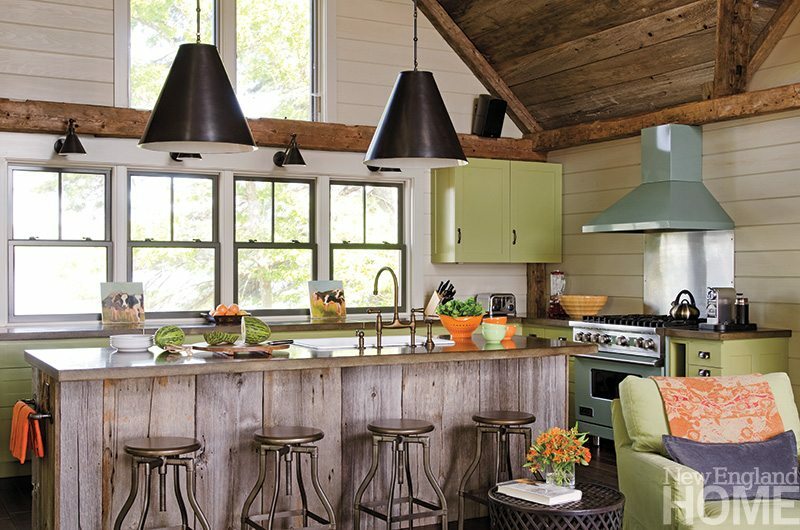 The pale palette is broken only by an accent wall in green, a custom color chosen to reflect a bit of the outdoors. 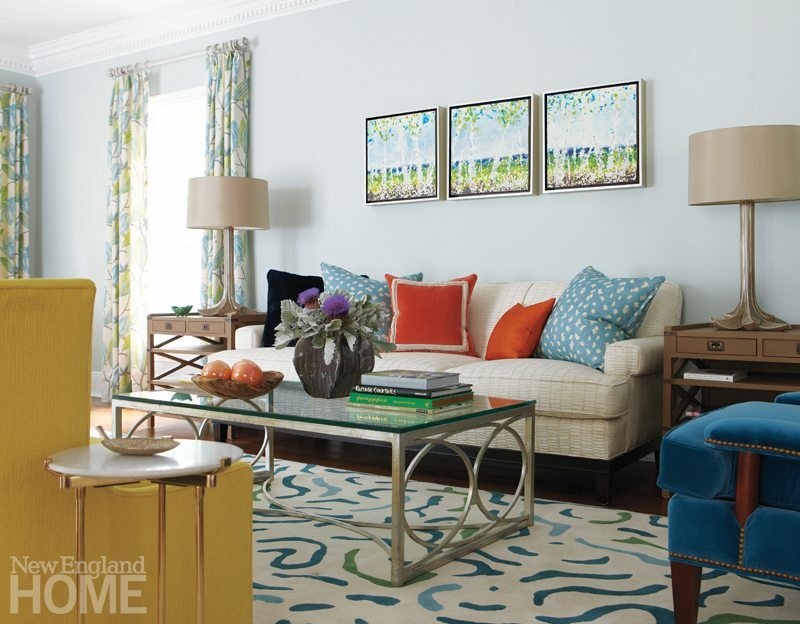 The eye-catching triptych above the sofa is by Darien artist Andrea Bonfils. To tie the color palette together in the living room, Deb Nicoud designed a custom, hand-woven rug. 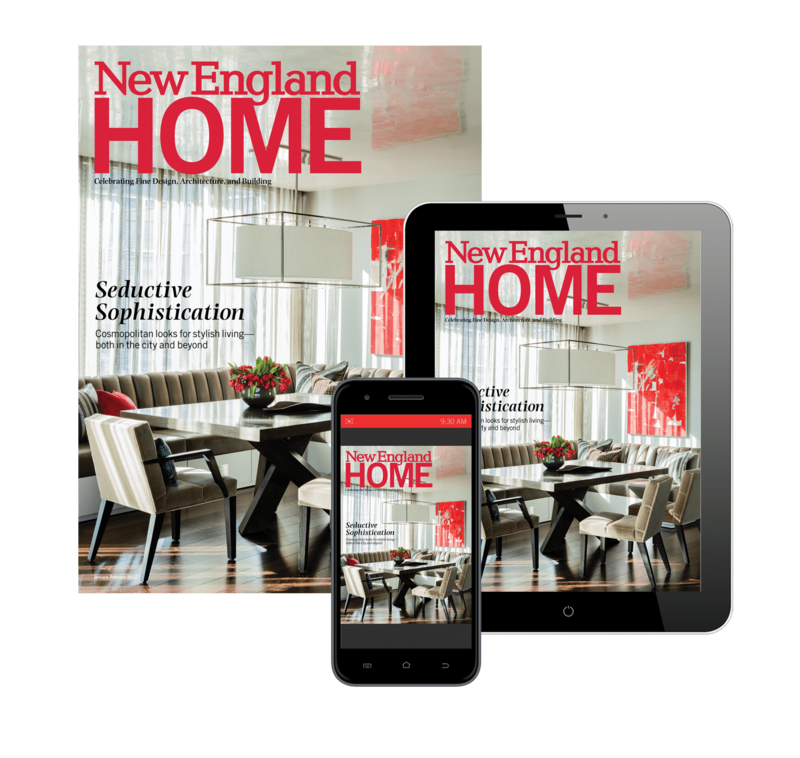 The new family room, outfitted with contemporary pieces, anchors the addition to the historic home. The straight lines of the upholstered master bed make a masculine counterpoint to the loveseat's feminine floral. The dining room wears playful wallpaper, a Venetian glass mirror and a silver-finish gilt wood chandelier for a decidedly feminine look. Green fabric chairs by Jonathan Adler bring it all together. 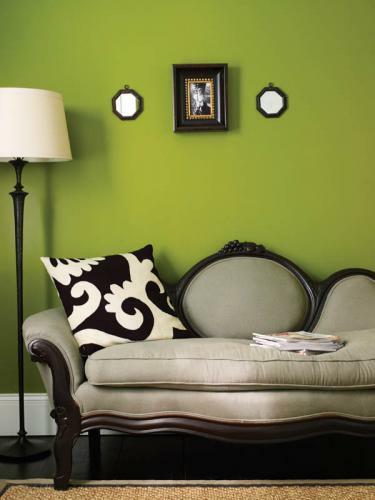 An antique lamp in the corner inspired the living room’s green accent color. 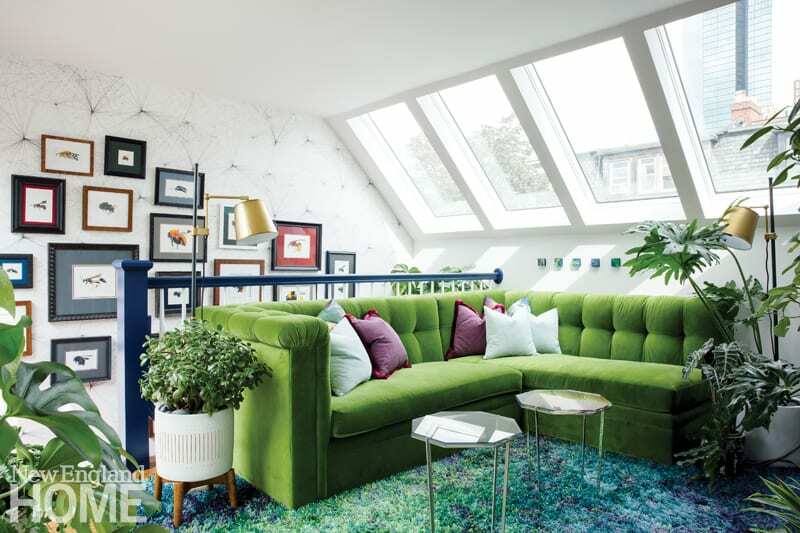 Varying shades of green bedeck the curtains, chairs, coffee table and pillows, and the apple green of a small wall nook makes an abstract painting pop. Pomeroy designed the L-shaped banquette in the wifeâs office, adding soft fringe along the bottom for a feminine, romantic touch. Twin slipper chairs add a note of color in the living room. The expanded master suite includes linen-clad walls and a custom upholstered bed with a pop-up TV hidden in the footboard. 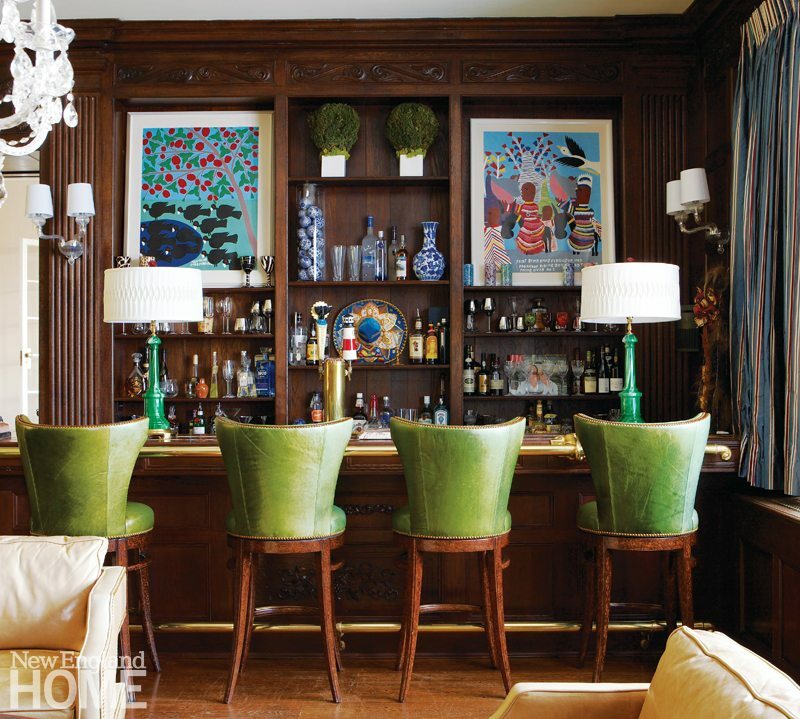 The dark cherry library was made more feminine with a jolt from green-lacquered walls and rich velvet accent chairs. 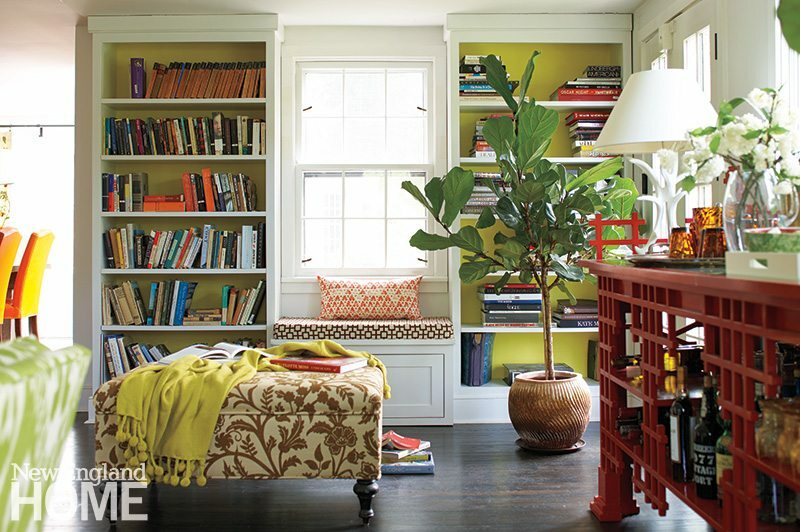 Color, pattern, and texture happily mix in the living room. Above the fireplace, double-armed sconces flank a painting by local artist John Vinton. The custom-cut and -bound rug hails from Faber’s Rug Company in Wellesley, Massachusetts. The graphic throw is by Jonathan Adler. The living room flows seamlessly into the dining room, where the large light fixture and rich dark-blue chairs add a dose of drama. Twin Lucille floor lamps by Oly bring an additional measure of symmetry to the open and airy living room. 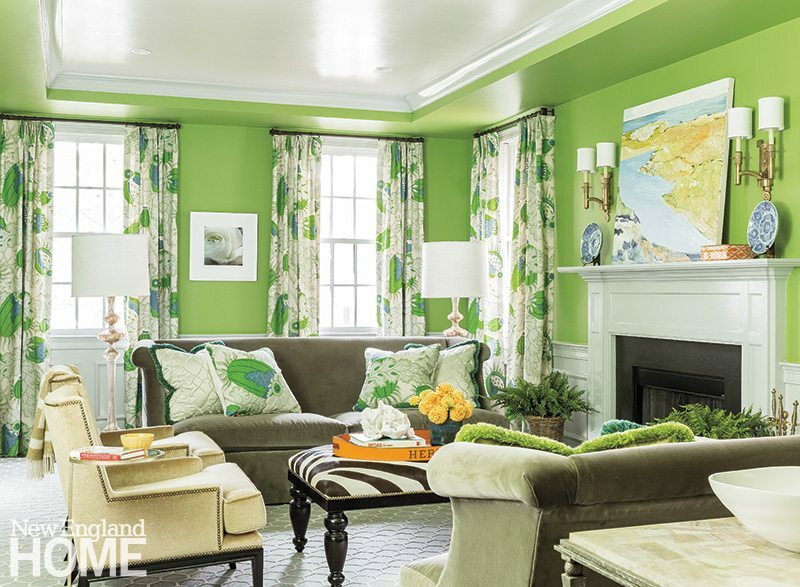 The lively Christopher Farr drapery fabric inspired the bold green wall color.